South Korea voiced strong regret Tuesday about the Japanese foreign minister's reported comments on soured bilateral relations in another sign of a deepening rift over history issues. 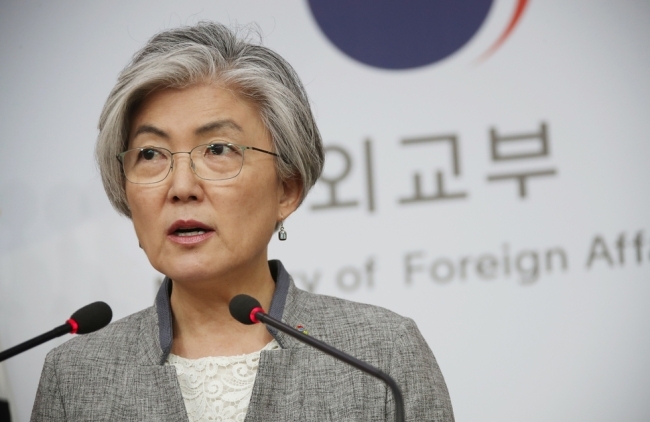 South Korea's top diplomat, Kang Kyung-wha, earlier said she's considering a visit to Japan, although no schedule has been set, in a bid to mend fences. Her counterpart, Taro Kono, however, said in a meeting with Japanese lawmakers that Kang does not need to come to Japan without a "proper" response to his government's demands, according to NHK. Late last month, South Korea's Supreme Court ordered a Japanese steelmaker to compensate four Korean men for their wartime forced labor. Seoul also announced a decision to disband a Tokyo-funded foundation on Korean women forced into sexual slavery by Japanese troops during World War II. Korea was under Japan's brutal colonial rule from 1910-45. South Koreans say Japan's contemporary leaders have yet to sincerely repent for the past wrongdoings and take full legal responsibility, while Japan claims all reparation-related issues have been already settled in state-to-state accords. Japan has urged the South Korean government to resolve the compensation issue for itself. A senior South Korean official expressed concern about Kono's reported remark on Kang's possible trip there. "If it's true, I think it's undiplomatic and inappropriate as a foreign minister in charge of diplomatic relations," the official told reporters, saying his statement reflects Seoul's formal view on the matter. He added the government is very concerned that Japan's leaders continue provocative rhetoric with regard to the Seoul court's ruling in ignorance of the fundamental problem.